BETTY – Oxfordshire Ironstone Co., Wroxton Oxfordshire, then Stewarts & Lloyds (Minerals) Ltd, Harlaxton & Woolsthorpe Quarries. 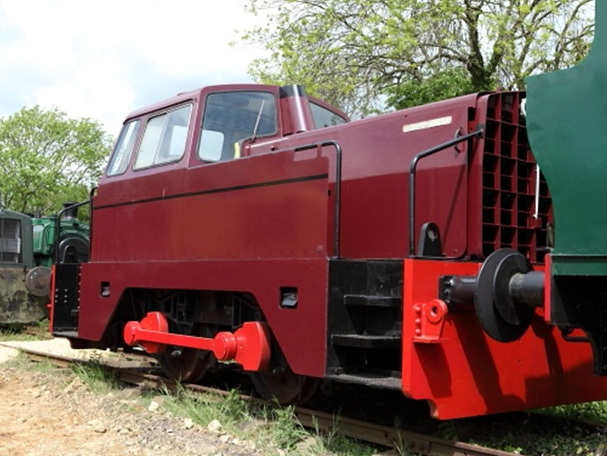 BETTY was delivered ex-works on 30st November 1964 as one of a series of 325 horse power, 30-ton locos ordered by the Oxfordshire Ironstone Company to replace their steam locomotive fleet, BETTY taking the name of a modern 0-4-0 Hudswell Clarke steam locomotive. These Sentinels took the names and duties of the former quarry locos (which all carried girls names), whereas a heavier series of identical looking Sentinels took over the duties of the 0-6-0 steam locos (all named after boys) in handling trains along the six mile long private railway to exchange sidings with British Rail. BETTY would originally have been fitted with buckeye couplings in order to handle the quarry dumpcars pioneered by this system and worked between the quarry face and the ore crushing plant. Unfortunately a major downturn in demand for home ores meant that the outlying Oxfordshire ore fields with higher transport costs were the first large systems to close and by 1967 the whole OIC fleet were rendered redundant when the quarries closed. BETTY was transferred in September 1967 to the Stewarts & Lloyds (Minerals) Ltd Harlaxton Quarries. Alternating with fellow OIC nomad MARY at Woolsthorpe Quarries and then numbered 8411/03, BETTY eventually held the dubious honour of working the last load of ore quarried in the “North of the Welland” group of quarries at Harlaxton’s Hungerton face on 14th February 1974, an event reported locally as “Black Valentines! The Museum was pleased to acquire BETTY when it became available from National Smokeless Fuels, Derwentaugh, and it joined the collection on 23rd April 1986.